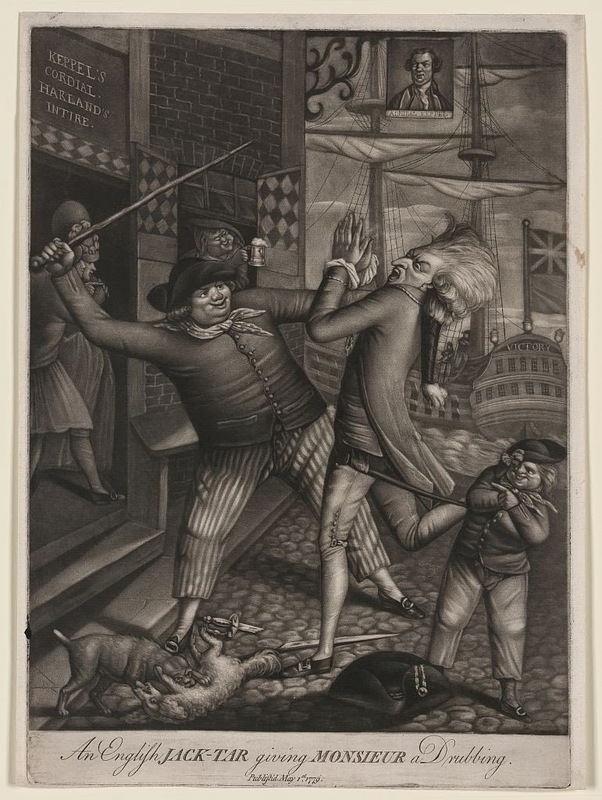 An English Jack Tar Giving Monsieur a Drubbing, by Robert Sayer, 1779, Library of Congress. As with many political cartoons of the period, this one is very busy. It is a metaphor for the First Battle of Ushant in 1778, in which the British Admiral Keppel (for whom the tavern in the background is named) engaged a French fleet. The conclusion was indecisive, and when one of Keppel's officers refused an order it led to courts martial and political mud slinging. You would never have guessed it from the message in this piece. 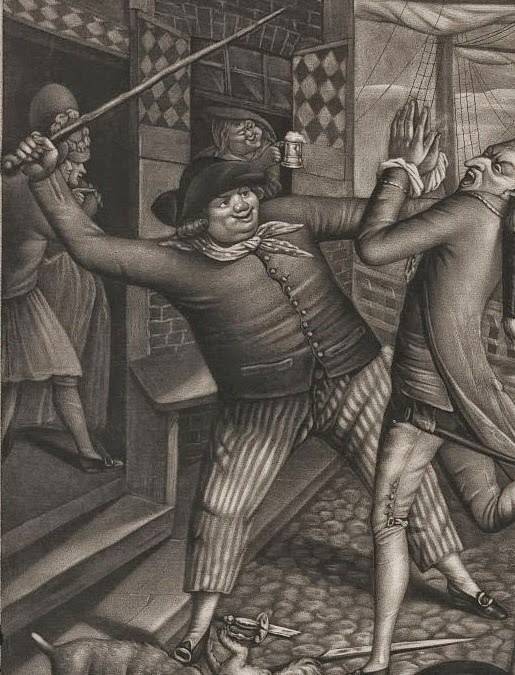 The pompous and frightened Frenchman struggles helplessly against the hulking Jack Tar, while an English dog attacks a French poodle, all under the happy gaze of a child and a man drinking in the tavern window. Standing in the doorway is another mariner with his arm around a lass, pointing out the ship HMS Victory that rides at anchor. This is one of the earliest images of the Victory, which had participated in the First Battle of Ushant. At the center stands Jack Tar. His is a cocked hat, clearly turned backward. It is without tape, button, or loop. His hair has side curls, but appears to be short. The neckcloth is a light color with polka dots. Jack Tar's jacket is single breasted with narrowly spaced cloth covered buttons, and slash cuffs without buttons. It has waist pockets and a narrow cutaway, ending right at the waist. Because of Jack Tar's posture, we get a good view of the fly front of his striped trousers: three buttons, two moderately sized and the top very large, all look to be cloth covered. Otherwise, he wears white stockings, pointed toe shoes, and oval buckles. In the doorway behind Jack, courting the lovely young lady, another tar wears a jacket, slops with breeches peeking beneath, white stockings, pointed toe shoes, and oval buckles. The creepy looking child to the right wears much the same as Jack Tar, though his hat has a large bow, and his trousers are white. Given the distinctive sailor's slop clothes the child wears, I would venture that he's a powder monkey or ship's boy.